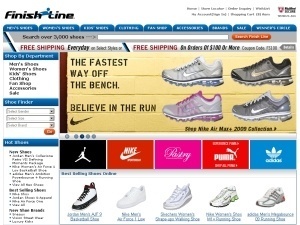 Coupon Code 20HLDY100 Shop FinishLine.com and get $20 OFF orders of $100 or more with code 20HLDY100 now through November 30th! Coupon Code 10HLDY75 Shop FinishLine.com and get $10 OFF orders of $75 or more with code 10HLDY75 now through November 30th! Coupon Code RUNFAST10 SAVE $10 ON "BAREFOOT" RUNNING SHOES OVER $60! Coupon Code Click to Activate NCAA Fleeces at Finish Line now 2 for $40! Coupon Code BOOTS10 Save $10 off $60 on popular Boots at FinishLine.com. Found a coupon for Finish Line?